If there’s one thing Sonic Dash 2 has, it’s an uphill battle to prove itself as a high quality mobile game. 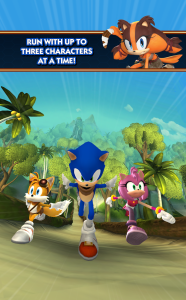 Not only does it have to live up to the original Sonic Dash, a highly successful Sonic mobile game with over 140 million downloads and a large cast of SegaSonic characters, but it has to rise above the stench left by Sonic Boom: Rise of Lyric. Has Hardlight Studios made a true successor to the original, or has the Boom curse hit once again? 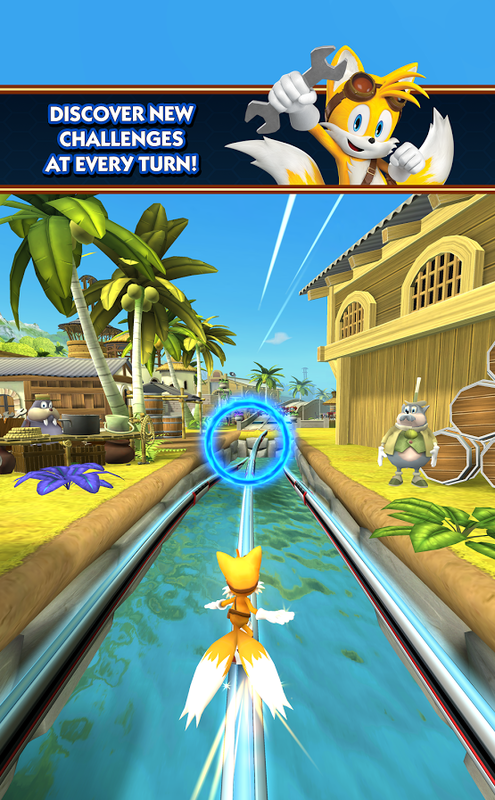 Hardlight does a lot to make Sonic Dash 2 differentiate from it’s predecessor while using the same basic controls. You still swipe left and right to change lanes, swipe up to jump, swipe down to spindash and double tap to do a dash once you dash meter is full. You also have random missions to complete just as the first, but that’s about it. 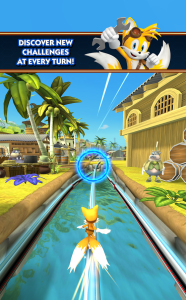 If there’s one thing Sonic Dash 2 does well, it’s packs a lot of originality into a genre that’s been done to death. Not all at once though. This fake screenshot is misleading. The first thing you’ll notice is that after you get an extra character (Amy or Knuckles very early on), you can switch to that character after going into a cave and banking some rings. This way, you can play up to three characters in one run. Each character also has their own attributes. Sonic is a ring magnet when Dashing, Knuckles can ground-pound enemies to help build up combos, Amy can turn enemies into rings while dashing, Sticks keeps enemy combos from breaking if you get hit and Tails gets you an extra revive. These can be important depending on what events or missions you’ll be taking on. Speaking of Events and Missions, there’s a lot here to keep you coming back. Missions are constant little goals you can do in the regular part of the game for rewards. Mostly easy goals like “jump 25 times times in one run” or “smash 20 robots”. You can play in mission mode pretty much all day with no limits on lives so you can work on your high score. Pretty generous compared to what you get from other “free to Play” games. Event mode is limited as you need tickets to play, but it tends to pay out bigger rewards. When in this mode, you can to spend an event ticket to take on a challenge. You are usually limited to 4 tickets, but more are earned through time. These events can take awhile to accomplish, but there’s usually mini-goals along the way. For instance, you might have to bank 2500 rings. This is a big task, but you get rewarded with prizes for hitting 10% of the goal, 25%, 40% and so on. There’s also the daily event of Score Chaser. This is where your global score really matters. The better your score or the closer you are to reaching your event goal, the higher your prize is. Need help with event goals or high scores? Call in the sprites. Everyday, you will get at least one sprite you can use either by checking in daily or getting them as prizes for finishing events. Sprites are basically the same as the Chao you get in games like Sonic Runners or Sonic Jump (Since Sonic Boom is a spin-off, I guess they decided to go with different creatures.) Sprites can be either a one time use, or permanent ones you can upgrade and evolve. One time use sprites can do things such as give you an extra revive or double your score bonus while permanent sprites will give you smaller boosts you can upgrade such as building the dash bar faster or enerbeams appearing twice as often. Once you’ve upgraded a sprite, you can evolve it further by combining three sprites together into one. Although initially, you can only use one sprite at a time, you can add up to two more by spending red rings. Sprites are great for offering a bonus towards goals and can be a great way to add strategy to your gameplay. But enough of the minute details, how does the game play? Well it plays a lot like Sonic Dash. Duh! Okay, okay, there’s a bit more to it than that of course. 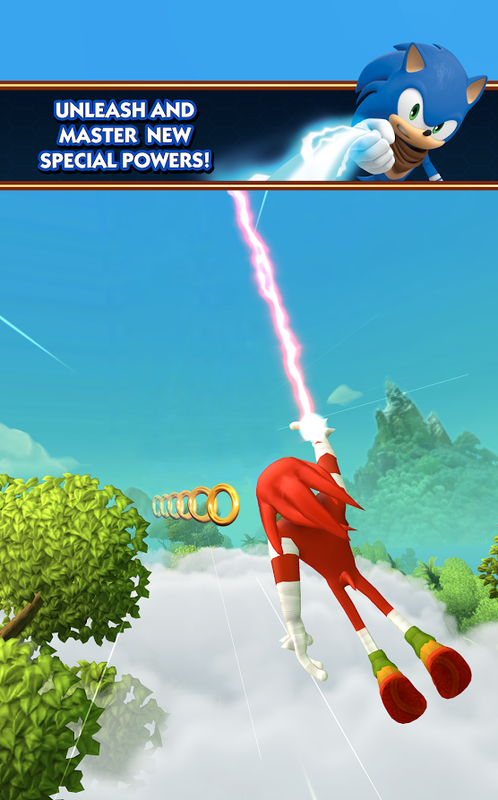 While you do the usual bit of dodging left to right, jumping over obstacles and spindashing enemies, you also have a new game play moment where you can swing on your enerbeams and collect rings and dash orbs high in the air. This part offers a different set of controls as you tilt your device left and right to collect the bits. It’s a short diversion but a very welcome change of pace even if brief. 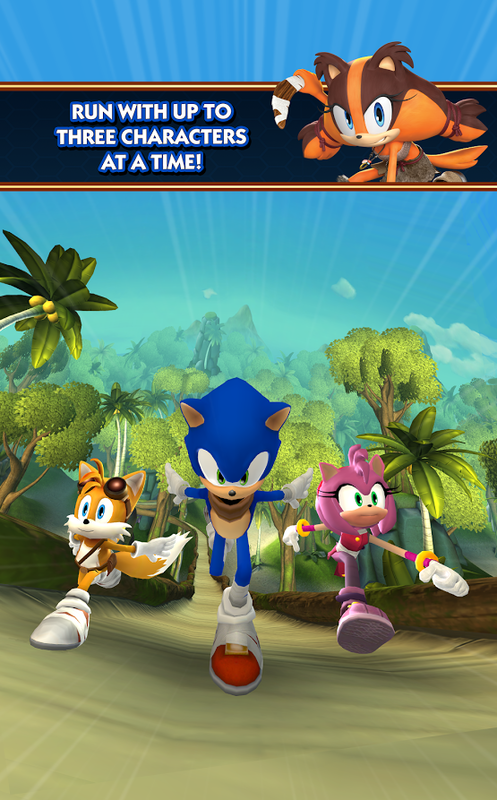 The one thing I’ll say is that it seems like it gets more difficult quicker than the previous Sonic Dash. About three levels in you’ll be having to quickly dodge trees and watch out for charging Motobugs. (I think this is the first time in the Sonic franchise where Motobugs have been a real threat.) But don’t feel discouraged. Leveling up your characters and sprites will help balance out the difficulty and help you towards a nice, high score. You say “That’s all very well and good Jason, but what about the economy in the game”? Don’t worry Sonic Runners players, you won’t be abused here. First, let’s discuss red rings. At first, they are given out pretty generously since the game wants you to buy your first character right away. You have your choice between Amy or Knuckles at 30 rings each while Sticks is 50 rings and Tails with his extra revive ability, is an expensive 70 rings. After a short while, red rings will be harder and harder to come by, but not so much that you feel cheated. Usually, you can find at least one red ring on the field every time you play the game (just keep a lookout or you can accidentally pass it up). You’ll also get red rings on occasion for doing missions, events and just playing each day. In fact, if you play it frequent enough, you should have the entire cast within a month of playing. But red rings are for more than just characters. You can spend 15 rings to add an extra slot for a sprite or to top out your upgraded character. You can also spend red rings on revives if you’ve run out of ads to watch. As of right now, it’s a pretty fair economy. You can spend $5 for 28 rings or $20 for 130 rings. That’s enough rings to get you the other 3 characters available right away! That’s a better offer than a half dozen or more chances on a roulette wheel and possibly ending up with nothing. Plus, it never feels like you HAVE to buy these rings. As I’ve said before, the amount you earn is gradual, but fair. The one thing where Hardlight is really pushing you to buy is the “Boom Boost”. For $1.99, you can add an extra revive, more chances at sprites and up to 6 tickets for events. A very good deal if it was permanent, but sadly it only lasts a week and then you’d have to pay again. It gets annoying as they advertise this to your face quite a bit. However, I always believe you should support a FTP game if you enjoy it, so I’d recommend trying it at least once. There are definitely worse deals out there. While I’m finding the game pretty enjoyable and the events addicting, there are some negative points I’d like to address. Please note that much like the original Sonic Dash, any nitpicks I have now could possibly be fixed in the near future as these games tend to evolve and improve greatly over time (unless that game is called “Sonic Runners”). First off is the graphics. While it can be highly detailed (especially in the backgrounds), the cost is a lower frame rate. Sonic Dash 2 plays at 30 FPS while the original plays at a solid 60 FPS. Also, the amount of detail can vary depending on what device you are using. so if you have a more low end device, you could get less palm trees and more N64 fog. Also, the background music is just the same high speed chorus over and over again. Only changing characters in the caves gives you some relief from that overdone tune. Add an extra tune for the different environment and I think it would work out better. Speaking of environments, I really feel this game could at least use one more. You’re going from jungle to village and back again over and over. I know you kinda did the same thing in the Seaside Hill level of Sonic Dash, but the more open environment made it feel more natural. I know the Sonic Boom cartoon is limited on environments, but adding something like the canyon area would help give the game a little more variety to it. One other thing this game is lacking over the first one is boss battles. While that came later on in the first Dash as well, it feels weird not having it in this one, especially since Eggman taunts you at the very beginning of the game. A boss battle would definitely help change things up a bit. But those are just nitpicks. The most valid complaint is just how glitchy this game can be sometimes. Several times, I’ve had to reset the game due to being stuck in the environment. Every single time, it was to do with the enerbeam mini-game. It doesn’t happen too often, but every time it’s due to that part. Considering that’s the exact part where the glitch happens, you’d think Q&A would have had that bug nabbed by now. 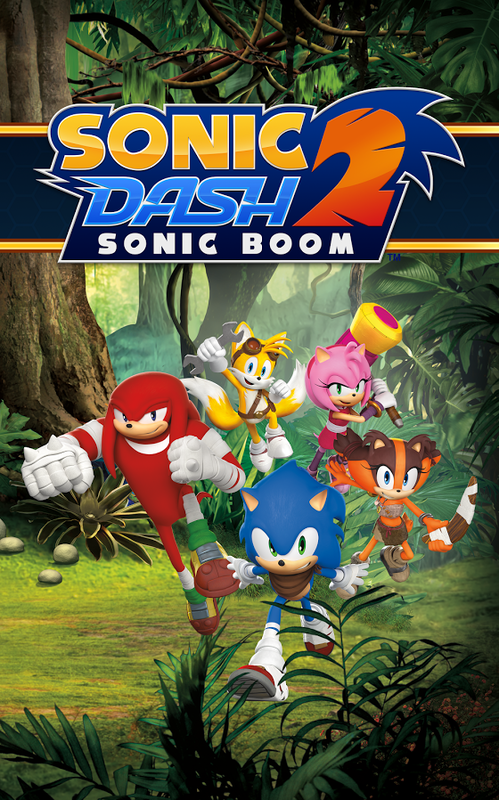 That said, Sonic Dash 2: Sonic Boom is a solid mobile title with plenty of goals to keep you busy and adds a lot more variety than the original Dash. However, the first one had a ton of characters to choose from while this one just has the main five. The good news is, there’s more characters on the way (Metal and Shadow most likely). Also, the game has a good economic system in place that doesn’t feel like it’s ripping you off. It’s hard to review mobile games like this (especially when they’re new) as they tend to change and improve (or get worse) over time. 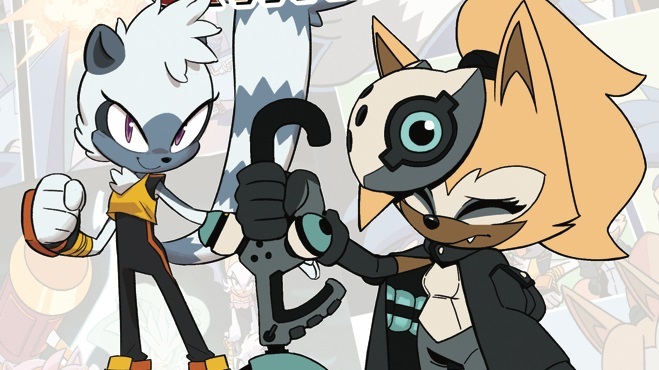 I hope people look past the bad taste Rise of Lyric left in their mouths and don’t just ignore the game on it’s brand alone because this is the best Sonic Boom title by far. Although I’ll admit, that’s not saying much. It looks like Sonic Dash 2’s soft launch is near it’s finale and will be making it’s way to other countries fairly soon. In this video, we get some more details on the game and a little bit of a “behind the scenes” look into the studio. This is just part one of a three part series so stay tuned for more! t.